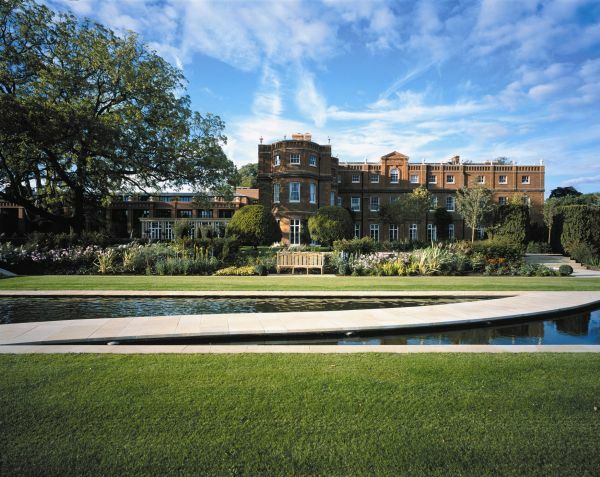 The Grove, London’s self-proclaimed country estate, has played host to everyone from Kylie Minogue to Johnny Depp. Its 300 acre grounds are a playground for the rich and famous, offering everything from croquet gardens and a championship golf course to a beach volleyball court, and all under the watchful eye of the resident 20ft topiary giraffe. On arrival, my friend Dr Heather and I shot straight to the Sequoia spa to wash away the memories of a fast-paced week in the capital. No sooner had we slipped into our cozzies did a bronzed god emerged from the dimly lit black tiled pool, shaking the water off his hair in what seemed like slow motion. Having clicked out of our hypnotic state, we escorted our wicked thoughts and wry smiles to the Jacuzzi for some prime time viewing. “He keeps checking us out,” said Heather. It was true, he couldn’t take his eyes off us. I twiddled my hair and attempted to look effortlessly saucy whilst jets of uncontrollable water shot up every orifice, leaving me looking more like a drowned rat than the beach goddess I was aiming for. Then a figure behind me caught my eye. Damn it, he wasn’t looking at us at all, he was gazing at a beautiful leggy blonde soap star looking serene and elegant behind us. “Oooh, it’s that pretty doctor from Casualty,” I said, surprised. “Holby City,” corrected (a real) Dr Heather. Glowing an embarrassed shade of beetroot, we slipped off to the steam room…and guess who was close behind? He perched opposite us and let out a deep sigh as he stretched his muscle-clad torso. I sat perspiring profusely, attempting to look relaxed and dreamy whilst feeling like I might actually keel over. As I casually tried to elongate my stumpy legs, I hit something…another bloody gorgeous actress, this time playing with her golden tresses and perfect pout. Are you kidding me!? This place is like a Mecca for soap fans, and men! We quit. Having given up on our afternoon of flirtation, we headed off to enjoy the hotel’s signature spa treatment; the English Rose Ritual. Combining exfoliation, Balinese massage and a nourishing scalp treatment, we soon felt far less fussed with our unsuccessful flirting and headed off to the hotel’s award-winning fine dining restaurant, Collette’s, to celebrate our sisterhood. A charming waiter carried us off towards a lavish lounge area rich in 18th century splendour, where we sipped champagne whilst looking over the sweeping countryside of Charlotte’s Vale. Having become dizzy from perusing the imaginative menu which sent us round in circles of indecision, we opted for the elaborate 12 course tasting menu (well why not, we had given up on bikini-clad enticement). We were instantly impressed when the dream team personalised the menu for us upon a request without so much as a sigh, indeed the glint in the waiter’s eye suggested it was an exciting challenge to acclaimed head chef Russell Bateman. As the bubbles took hold and we laughed upon our earlier poor attempt at seduction, the creative dishes flooded in. A resplendently rich veal tartare with winter truffle and quails egg was soon followed by a velvety foie gras with zingy apple. To lighten the load, a dish of delicate Cornish cod arrived with an accompanying oyster and caviar sauce. Coordinated sighs rung out as the tender pork cheek with pineapple, coconut and coriander melted in our mouths and once again as the aged rib of beef circulated its juicy swell. Just when we thought we could not manage another bite, a creamy Colombier cheese arrived, generously stuffed with black truffle. In the morning, having enjoyed a leisurely soak in our roll top bath, I threw open the curtains. Warming sunlight came streaming through our French windows and after a few minutes taking the view in from our balcony, we trotted down to breakfast. As I began filling my bowl with sweet strawberries I felt a jab in my side as Heather pointed out another celebrity. “He’s the evil guy, you know the one on Eastenders, didn’t he beat up Phil?” I replied, “No, wasn’t he a murderer in a gang?” We both looked at each other dumbfounded and quickly returned to the strawberries as he parked himself next to us, wondering what all the excitement was about. Having left our surreal breakfast, we took a stroll around the 300 acre grounds, well, a few of them anyway. The Grove prides itself on being ‘funky’, and around every corner hides an arty sculpture, a topiary animal and of course a celebrity. “Celebrity bingo!” shouted Heather as she pointed to footballer-turned-ice-skater Robbie Savage on the golf course, who suddenly lost his swing, distracted by the strange girls in the undergrowth. “I prefer him in lycra”. Rosy cheeked from our celebrity safari, we headed back to the pool for one last soak before returning to reality. We eyed our surroundings carefully, tanned god: check. Stunningly beautiful actresses…No. At last, a fair playing field. Having spent the first five minutes spying from behind a copy of OK! Magazine, we slipped into the Jacuzzi. As I let the warm bubbles envelop my body, I couldn’t help but notice the tanned god’s intense stare. I checked behind me, no supermodels or leggy blonde actresses, he really was staring at me. As I practiced my poolside catwalk strut towards the changing rooms, feeling just a little bit smug, he turned and gave me a Colgate-style smile. Ha! Models move over, the girl-next-door is back. As I rushed to tell Heather, she swung me around in hysterics to face the mirror…I had magazine ink all over my face. The Grove is a member of Great Hotels of the World Luxury Collection. Rooms start from £285. For more information or to book please visit the website or call 020 7380 3658. The Grove, Chandler’s Cross, Hertfordshire WD3 4TG. Tel: 01923 807807. Website.